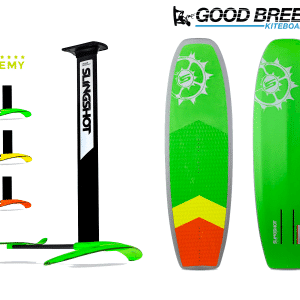 Categories: Uncategorized, Kiteboarding, Kites, All Products, Trainer Kites, Foil/Traction. The multiple option kite can be used a steerable trainer kite or a one line fixed kite. What we think: This kite be controlled with two lines like your standard foil or trainer kite. 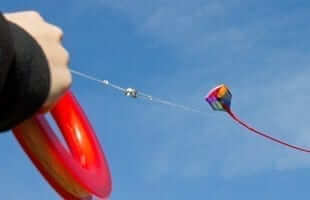 It can also be flown as one line kite which is great for little kids or just flying while hanging out at the beach. The tail is detachable and looks great in the sky. 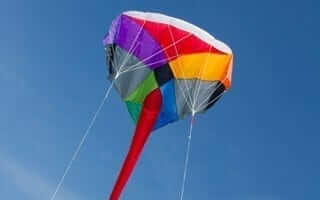 Perfect alternative for someone looking at stunt kites but not wanting to break them. Can be fun for adults on the two line mode and then easy for a small child on the one line mode. Versatile little thing! Great for gifts. The frameless Multi-Kite combines all the good things about kiting. The contemplative and relaxing side of single line kite flying and the sporty side of stunt kite flying. With this kite, both becomes so easy that we recommend the Multi-Kite for kids ages 10+. Flown as a single line kite, it develops light but noticeable pull. The long tube tail helps to stabilize its flying characteristics. 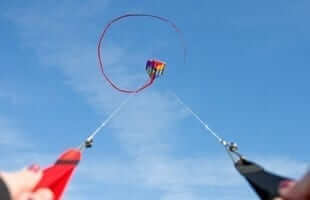 Simply take out part of the bridle line, attach flying straps and the Multi-Kite becomes a stunt kite. Perfect for beginners, the kite flies slowly which helps the first time flyer to perform loops, turns and dives with ease. The attached tube tail provides a colorful trail that follows the kites every move.